The city of supposed tolerance, San Francisco, showed a few too many of its true colors earlier this month when the Board of Supervisors attempted to censor pro-life banners placed around the city in preparation for the Walk for Life West Coast (WFLWC), which is scheduled to take place this Saturday, January 25. 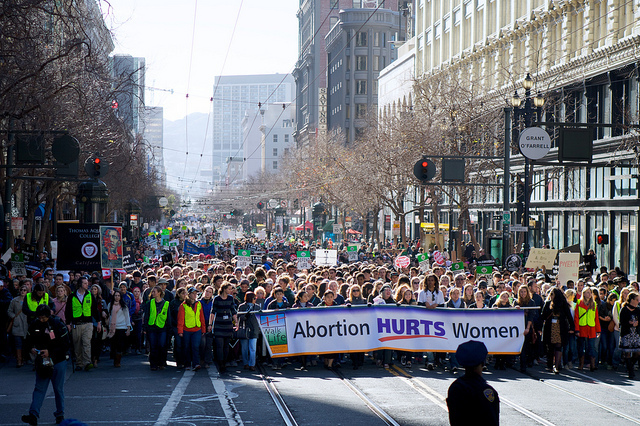 The banners read, “Abortion Hurts Women” — and it certainly does. Not only is abortion one of the safest medical procedures in the United States, but denied, abortion care is what hurts women. Eva Muntean of Walk for Life said her group obtained a permit and met all the criteria for their banners. She also said Campos’ position is ridiculous. “Physically and psychologically, families are hurt by abortion. I welcome them to come and to listen to these talks and just find out exactly first hand from people that have abortion, how it has hurt them,” she said. Muntean said the resolution flies in the face of San Francisco’s reputation as a tolerant city, noting its tolerance doesn’t seem to extend to different points of view. Eva’s full comments can be found here.